﻿ Coat Angels - Keep the children of Chicago warm. FOR EVERY COAT WE BUY, A CHILD WILL BE WARM THIS WINTER. FOR EVERY COAT WE DON'T BUY, A CHILD WILL BE COLD. IT IS TRULY THAT SIMPLE. How Coat Angels works is simple, too. Each year, we collect names from teachers and social workers at schools in neighborhoods facing devastating poverty rates.Then we host fundraisers and collect contributions from generous individuals and businesses. 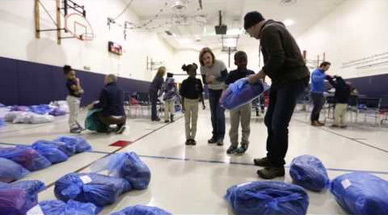 With the money we raise, members of our all-volunteer team shop sales and discount stores and work with our retail partner, then bag and personally deliver coats, fleeces, hats and gloves to some of the neediest children in Chicago. Coat Angels receives far more requests than we can fill, so every donation of money or time is meaningful, appreciated and makes a huge and immediate difference in the life of a child. We invite you to explore the site, and learn how you can help ensure that no child goes cold this winter. different from a coat drive. The children often write us wonderful, heart-warming and heartbreaking thank you notes. 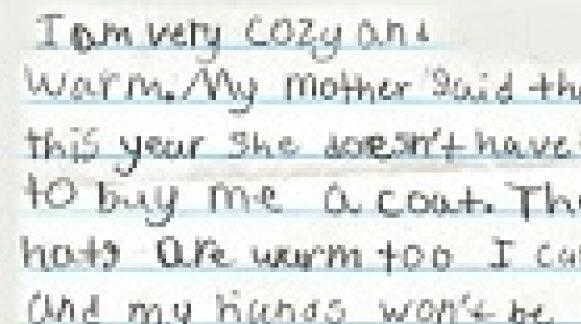 In a a letter from our first year, one child called us “Coat Angels,” giving us our name. Coat Angels is a 501 c, not-for-profit organization. We are strictly volunteer and do not have any offices or staff. Every single penny we raise goes directly to buy coats, fleeces, hats, and gloves. Photographs courtesy of Susan Ryan Photography.